Sent to King Louis XVI's cabinet du Conseil at the Tuileries Palace on May 15, 1792. A. Pradère, French Furniture Makers, 1989, pp. 407-408, fig. 504. P. Verlet, Le Mobilier Royal Français, Vol I, 1990, pp. 44-45. Louix XVI and his family were confined to the Tuileries from 6 October 1789. The palace was in a particularly bad state of preservation having been visited by Louis XV for the last time in 1744. However the Queen had retained a small apartment there since 1784 for her visits to the Opera. These furnishings and the remaining furniture at the Tuileries were supplemented by fresh orders from the Garde-Meuble and with existing pieces brought from the other royal palaces. By 1790 Louis XVI appears to have realized that the Tuileries was to be their permanent residence and both he and Marie-Antoinette began ordering suitable permanent furnishings more in keeping with the palace's new role. For a futher discussion of the Tuileries during this period see M. Battestin, 'La famille royale aux Tuileries et l'installation de mobilier', De Paris à Versailles, Exhibition Catalogue, Paris, 1989, pp. 65-69. The commode, which had been listed in the Garde-Meuble inventory in Madame Thierry's bedroom as No. 361, only stayed at the Tuileries palace a short time. The pair was sent to the dépôt de l'Infantado where they are recorded in 1795 under the numbers 47 and 48. They were proposed in the first lottery and, although there is no firm record of this, most probably sold. 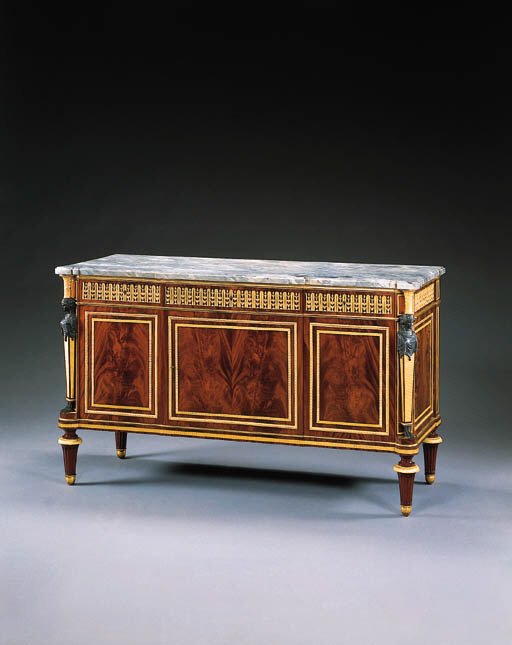 The commode now in the Louvre (C. Dreyfus, Musée du Louvre, Le Mobilier Français, 1921, pl. 34) was purchased by the Garde-Meuble Imperial after 1852 and placed in the Tuileries. Guillaume Benneman (died 1811), maître in 1785, was born and trained, as were so many of his fellow top ébénistes, in Germany. He worked almost exclusively for the crown from 1786-1792, up until 1788 under the directorship of Jean Hauré. His early work involved considerable transformations and updating of existing pieces in line with the spirit of economy at the time. He is known to have worked with Weisweiler and was used by the Garde-Meuble as an alternative to Daguerre. His commissions included pieces for Versailles, Saint Cloud and the Tuileries. In his dual role as premier valet de chambre du Roi and intendant du Garde-Meuble he enjoyed two apartments, furnished by the crown, in each of the royal palaces. His Paris apartment was in one wing of the Hôtel du Garde-Meuble in the rue Saint-Florentin. It was here, in the upholstery of a sofa in his cabinet, that was found 120,000 livres in gold following his arrest on August 15, 1792. Thierry did not survive the Revolution and was murdered on September 2, 1792. In 1786-87 he redecorated his apartments in the Hôtel du Garde-Meuble, in the most up-to-date taste using the same artists and craftsmen as in the royal palaces. For a discussion of the Garde-Meuble under his stewardship and of the furnishing of the Hôtel du Garde-Meuble, see J.J. Gautier, 'Le Garde-Meuble de la Couronne sous Thierry de Ville d'Avray', De Paris à Versailles, Exhibition Catalogue, Paris, 1989, pp. 53-58.